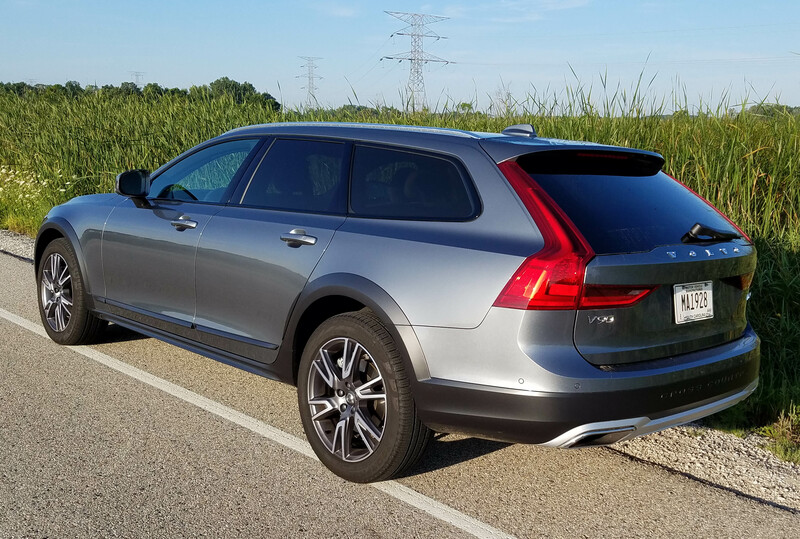 Give Volvo credit for creating a high-end wagon that looks like no other. 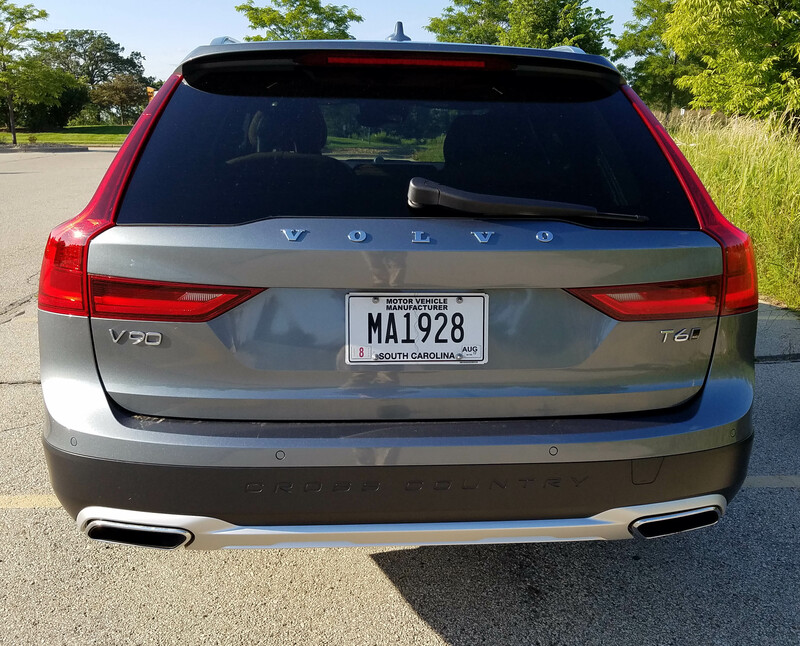 The V90 Cross Country is big and features a swoopy profile that looks downright slick. 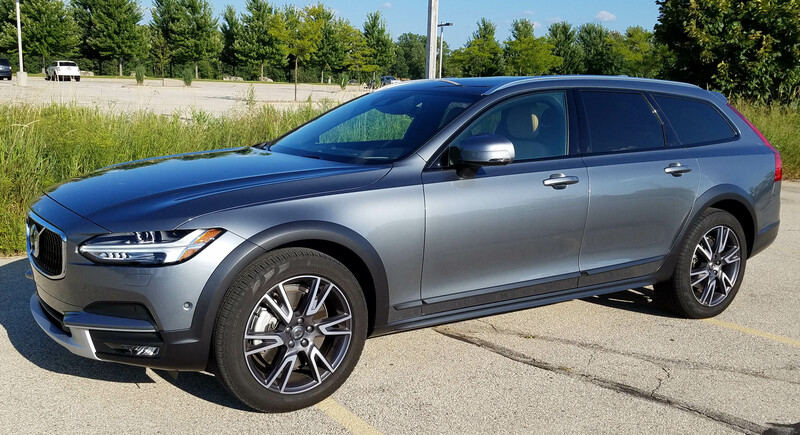 The Cross Country part tells you the Volvo prefers to think of itself as a crossover, and it does have all-wheel drive and 8.3 inches of ground clearance. But it looks more like a wagon and feels absolutely enormous. It most reminds me of Chrysler’s former swoopy (in a different way) Magnum wagon. 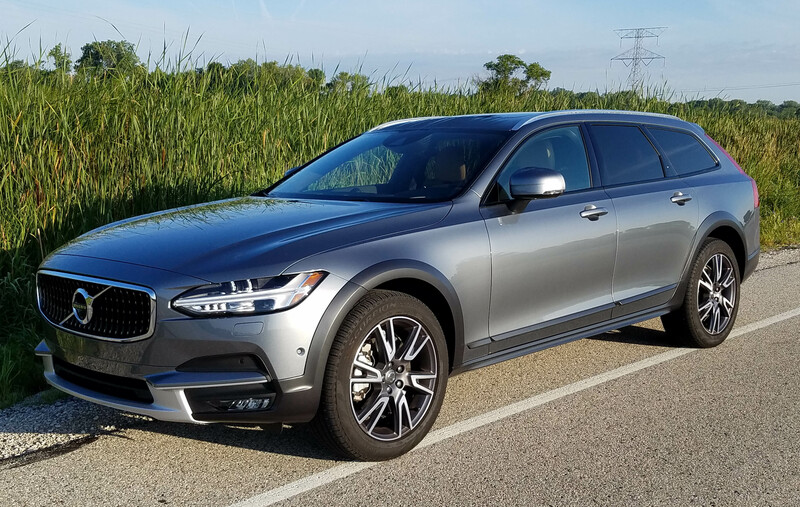 The V90 Cross Country is nearly as big as last week’s full-size luxury sedan, the Genesis G80, but weighs a couple hundred pounds less. That’s important because despite its weight advantage the 2.0-liter supercharged and turbocharged I4 doesn’t give it the pep I’d heard that the Volvo was to have. The I4 boasts 310 horsepower and a 295 torque rating, but there’s hesitation every time you get on the gas and the wagon simply feels heavy. Not sure if it’s the engine or the 8-speed automatic transmission that seems to make it hiccup when you first want the power. Likewise the steering feels heavy, and while heavy and precise is good in luxury cars, this was heavy and somewhat numb. The car didn’t feel responsive, mostly like a big wagon or crossover you point in a highway lane and let it muscle on down the road. Some folks will like that, and the ride here is good, some firmness, but compliant enough to cope with chunked up cement streets. It’s easy to drive and ride in, and gets reasonable gas mileage due to that dual super/turbo action. I managed 24.4 miles per gallon in about 60% city driving; oh, and the V90 prefers premium gas. The EPA rates this one at 22 mpg city and 30 mpg highway. Certainly there are the usual electronic goodies to aid performance, like the drive mode selector, a roller knob on the console is used to shift it between Eco, Comfort, Off-Road and Dynamic modes. Comfort is fine for most occasions, but Dynamic delivers more power, just not as smoothly as I’d expect. There’s a start-stop feature to save fuel, healthy disc brakes and both traction and stability control. And remember, this has AWD, so will have better grip in sloppy weather than a front-drive wagon or crossover. Inside the car is beautifully detailed. The silver test car (metallic paint adds $595 to the sticker) had caramel tan leather seats and a black dash to give it a classy black and tan look. There’s chrome trim including the fancy Bowers & Wilkins ($3,200 extra) stereo system’s speaker covers in the doors. That creates a jeweled, high-brow look. The console is tan and black too and there are retractable covers on the dual cup holders and a small storage bin at the base of the center stack and console. That’s a good place for keys, or even a cell phone. Seating is mildly contoured and comfortable with two memory settings for the driver’s power seat, which has an adjustable lumbar setting. The front seats are heated, as is the hard leather steering wheel. The wheel is a manual tilt/telescope number. Oddly, at this price, the front seats are not cooled. Rear seat room is generous and those rear seats will fold flat to boost the already sizeable cargo space under the power rear hatch. Overhead is a panoramic sunroof too. But there are a few issues inside, some minor, some possible deal breakers. For shorter drivers the lower portion of the side window frames are tall and make you feel as if you’re sitting well down in the car. No way you can lower the window and rest an elbow on the window frame. Also limiting visibility are huge side mirrors. While they provide a good rear view, they block some of the front-to-side view at intersections. 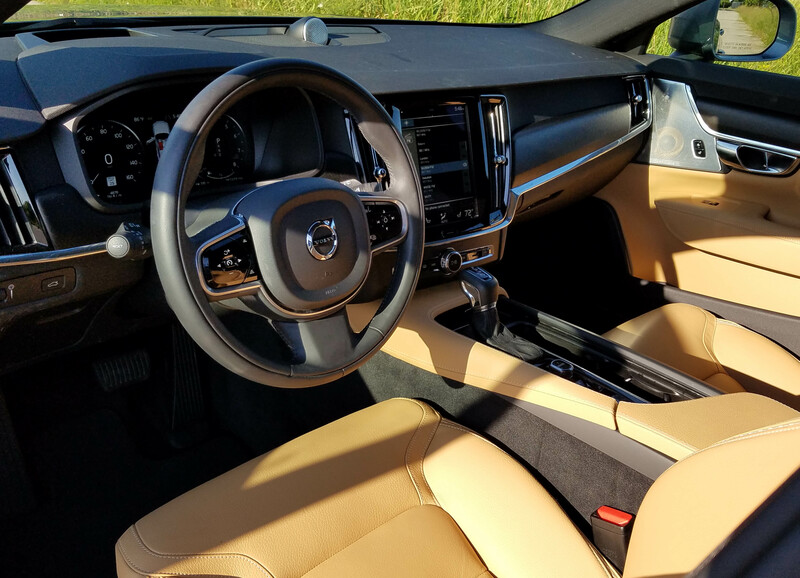 In addition, Volvo provides a large vertical touchscreen to adjust virtually everything, from radio and navigation to climate controls and that’s where I took exception. You must constantly tap the screen to adjust the temperature up or down a degree or two instead of simply rotating a knob a bit. The same is true of adjusting the heated seats and steering wheel. This screen acts like an Ipad so you can slide your finger over it to move to another screen, but the choices here seem endless and not easy to select or use as you drive. While better than some systems using a touchy mouse on the console, this system can be frustrating, sort of like Cadillac’s CUE infotainment system. Then there are the sun visors, which do not slide, a small thing, but still. Certainly the Volvo looks like a luxury wagon and the interior will make you feel you’re aboard something special. Pricing begins at $55,300, plus a $995 delivery feel. But the test wagon added nearly $8,000 in options, the priciest being that fancy stereo system. More helpful is the $1,200 air suspension option, which no doubt helped make the V90 Cross Country’s ride so darned nice. So this one tilted the cash register considerably, ending up at $64,640. That seems a bit high compared to its closest competition, the Audi A4 All-Road, which goes for about $10 grand less. And if functionality drives your decisions more than luxury and branding, then a well-equipped Subaru Outback would run about $20 grand less. 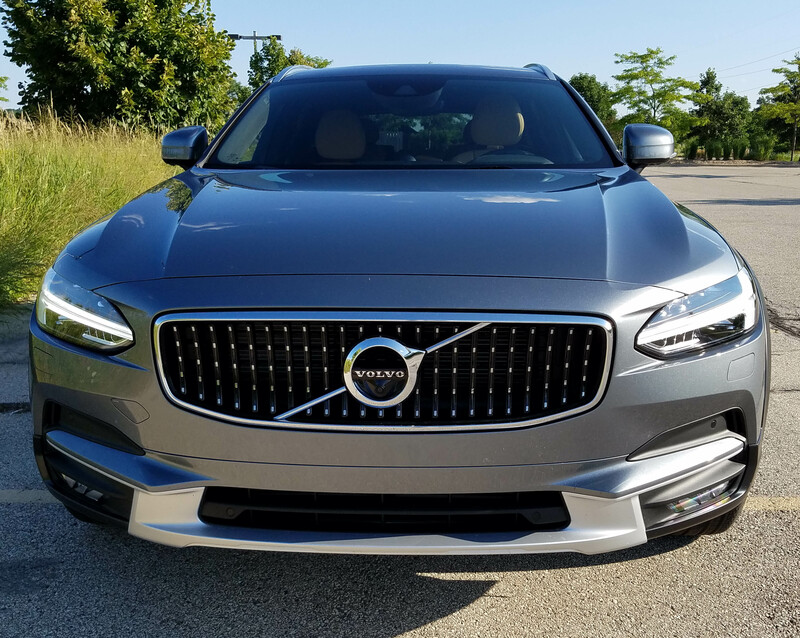 Still, the Volvo V90 Cross Country is a looker that will garner attention at stoplights, gas stations, and no doubt country clubs. But it’ll hustle through mud and muck and haul plenty of cargo and passengers in comfort too. And we all want to look “Mahvalous”, don’t we? 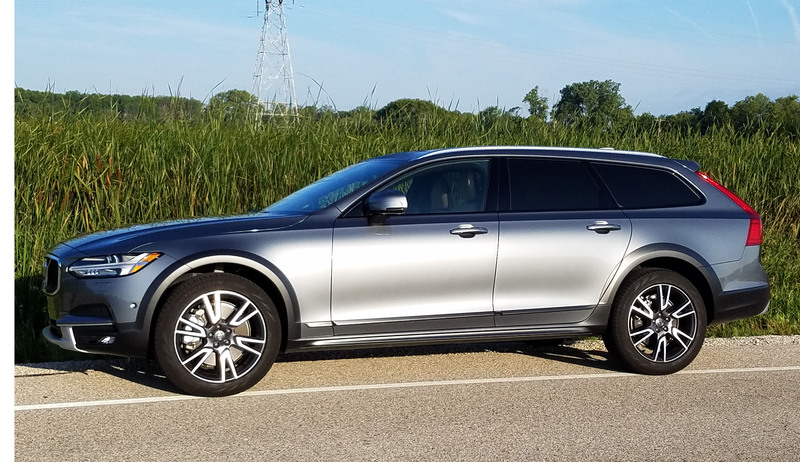 Hits: Big roomy wagon with swoopy profile, good ride, ok power and a big panoramic sunroof. Sharp-looking interior with comfortable heated front seats and a heated steering wheel. Plenty of cargo room, power hatch, plus AWD. This is a stylish ride. Misses: Acceleration hesitates, steering is heavy and numb, plus huge side mirrors block front-to-side view. Tall door window frames, clunky climate controls and seat/wheel heat via touchscreen, visors don’t slide, and no cooled seats despite premium price.